This hexcrawl covers 16 pages (not counting the front and back cover and their insides), with about ½ a page devoted to editorial and explaining how everything ties together, leaving us with 15.5 pages of content, so let’s take a look! So, I am, in spite of sometimes having issues with parts of his work, someone who enjoys the type of material Geoffrey McKinney brings to the table. As such, I have already covered his self-published, first 4 Carcosa hexcrawls…and when they left me wanting more, I figured I could check out his Wilderness Hexcrawl-series as well. First things first, in case you’re not familiar with these: As per the writing of this reviews, this module is only available in print, as a saddle-stitch paperback, to be more precise. As such, I can’t comment on any electronic features or the like. Rules-wise, this uses AD&D-rules and references them regarding spells, notating of attacks, etc. Now, something that is pretty crucial for you to decide on whether you’ll enjoy this would be how you prioritize aesthetics in your purchases. You see, the cover artwork is the only one found herein. The layout adheres to a stark two-column standard and sports no graphical elements or the like – this is, quite simply, two columns of text. Hex-headers have been bolded, spells are italicized (and so are magic items), but that’s about all the formatting you’ll get – if you are looking for anything more advanced or convenient, look elsewhere. In fact, the pages, much like in the Carcosa-crawls, aren’t even numbered, which makes finding information inconvenient, unless you pull out the markers. When a village is noted, it lists population and number of able-bodied folks as well as significant NPCs, which have their alignment and class as well as their level noted. The back cover of the module is a rather nice hex-map that is a step up from the Carcosa-maps. Why? Well, while the white numbers and hex-borders are still here, they now have a shadow added, which makes them easy to decipher, even against a backdrop of a yellow desert. A downside of the hex-map, nice though it is, would be that points of interest like settlements, monuments, etc. have all been noted – though this time around, not all such locales have been fitted with a name, which is a good thing as far as I’m concerned. It should also be noted that this series is not intended to be the author’s usual blend of the weird, instead focusing on more traditional fantasy – something I will take into account when rating this. The module begins with a brief summary of the geographic features…which sport an odd and imho annoying peculiarity: While plenty of places have normal, proper names, you can e.g. read “G__y Mountains” or “M____d” here – the referee is expected to fill these in. I really dislike the inconsistency here – either provide names for all locations or none – when I give one of these places a strange name, chances are I won’t run with “Silver Peaks”, right? Anyway, I think that’s inconvenient. Your mileage may vary. Okay, this out of the way, let us dive into the main meat of the module – from here on reign the SPOILERS. Okay, we begin this hexcrawl with basically a roadside encounter, where the PCs can hunt down a bulette, which may then be turned into a magical shield – while not brilliant, this is a solid start and better than most entries featured in the direct predecessor. 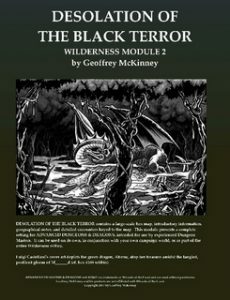 A natural pit containing horrid stench, inhabited by otyughs, a lair of fire drakes, mistaken for proper dragons…we get some decent wilderness encounters throughout the booklet. Now, as before, the settlements that can be found note important NPCs and the number of able-bodied folks, but also are a bit more interesting, as they can act as a hub of sorts – we get a variety of different connections from the villages to other hexes, making everything seem less fragmented and sterile, so that’s a plus. There are also some links to #1 in the series here and there – for example, when it comes to a temporal stasis’d gnome, who may become a hireling. A settlement haunted by wolfweres is a bit weird – personally, I like the set-up, but pulling out my AD&D-resources, I have to comment on the pdf somewhat mixing what wolfweres and werewolves are and how they operate, which can lead to somewhat weird in-game logic inconsistencies. referees should take care in the context of this section. Following the theme of the evil worm cultists, we can also find a lost shrine of the strange cult and unlucky PCs exploring the remains of the fortress of the eponymous Black Terror (whose identity remains elusive and open for referee choice) can walk right into the very potent high-priest, who may well flip the alignment of unlucky PCs…so if that is an aspect of old-school gameplay you tend to be weary of, note that he is pretty much the BBEG of the hex-map: He is by far more potent than pretty much everything else. While all of this does sound, correctly, I might add, as though this booklet had inherited the dubious aesthetics of the predecessor, this is not wholly true, for we do get some entries that go a bit beyond: I really enjoyed e.g. the idea of the Argent Death, a particularly deadly mining gas – exploring such a poisonous, deadly place is just what adventurers should do. Similarly, the idea of a strange horn that may summon silver dragons from beyond the north wind is interesting and oozes Tolkienesque pathos. While the humanoid tribes described do not necessarily win awards, exploring a ruin suffuses with runes that explode in irregular intervals makes for a great exercise in smart playing…so if a referee is willing to expand that entry, there most assuredly is some awesomeness there. In a somewhat interesting nod to the Dark Souls franchise (Pr so I assume), there is a hex where generations of guardians have kept a fire burning…and the PCs may well end up playing matchmaker there. We can also find a boulder suffused with ancient magics, the flame of life, which may sear or heal…there is, frankly, more wonder to be found herein than in the previous installment, and that’s a good thing. So yes, this is a huge step up. It still is not truly remarkable. Editing and formatting are very good, I noticed no undue accumulation of typos. I already commented on the formal peculiarities above, so let me get to the meat of this book’s issue. Geoffrey McKinney’s second Wilderness hexcrawl is definitely a step in the right direction for the series. Don’t get me wrong: This is still very inconvenient to use; it lacks any pretensions of a metaplot and all settlements are small and far in-between…but then again, this is the wilderness, so that is expected. The potentially allied and neutral powerful NPCs that can be found here and there are nice and rather interesting. The entries themselves are more interesting and include some gems and visuals that carry the spirit of classic fantasy in a rather neat and inspiring manner. This is better than the first installment of the series in pretty much every way. If you’re looking for a somewhat vanilla hexcrawl with a couple of nice ideas to develop into full-blown adventures, you can do worse…but also better. While this hexcrawl is nowhere near as bad as the blandfest that #1 in the series was, it also falls somewhat short of what Geoffrey McKinney can deliver. In the end, this is a decent hexcrawl, but, in hindsight, not necessarily one I would buy again. Hence, my final verdict will clock in at 2.5 stars, rounded up due to my policy of in dubio pro reo. You can get this hexcrawl exclusively here on lulu.